All communication is based on the Request/Response pattern. Only clients can send a request to a server. And servers can only send responses to a request. Usually, the server is hosted on the (physical) device, such as a sensor or a machine tool. A server does not have to immediately respond to requests and responses may be sent in a different order. This keeps the server responsive when it takes time until a specific request has been processed (e.g. a method call or when reading from a sensor with delay). Furthermore, Subscriptions (aka push-notifications) are implemented via special requests where the response is delayed until a notification is generated. A client-server connection in OPC UA consists of three nested levels: The raw connection, a SecureChannel and the Session. For full details, see Part 6 of the OPC UA standard. The raw connection is created by opening a TCP connection to the corresponding hostname and port and an initial HEL/ACK handshake. The handshake establishes the basic settings of the connection, such as the maximum message length. SecureChannels are created on top of the raw TCP connection. A SecureChannel is established with an OpenSecureChannel request and response message pair. Attention! Even though a SecureChannel is mandatory, encryption might still be disabled. The SecurityMode of a SecureChannel can be either None, Sign, or SignAndEncrypt. As of version 0.2 of open62541, message signing and encryption is still under ongoing development. With message signing or encryption enabled, the OpenSecureChannel messages are encrypted using an asymmetric encryption algorithm (public-key cryptography) . As part of the OpenSecureChannel messages, client and server establish a common secret over an initially unsecure channel. For subsequent messages, the common secret is used for symmetric encryption, which has the advantage of being much faster. Different SecurityPolicies – defined in part 7 of the OPC UA standard – specify the algorithms for asymmetric and symmetric encryption, encryption key lengths, hash functions for message signing, and so on. Example SecurityPolicies are None for transmission of cleartext and Basic256Sha256 which mandates a variant of RSA with SHA256 certificate hashing for asymmetric encryption and AES256 for symmetric encryption. The possible SecurityPolicies of a server are described with a list of Endpoints. An endpoint jointly defines the SecurityMode, SecurityPolicy and means for authenticating a session (discussed in the next section) in order to connect to a certain server. The GetEndpoints service returns a list of available endpoints. This service can usually be invoked without a session and from an unencrypted SecureChannel. This allows clients to first discover available endpoints and then use an appropriate SecurityPolicy that might be required to open a session. Sessions are created on top of a SecureChannel. This ensures that users may authenticate without sending their credentials, such as username and password, in cleartext. Currently defined authentication mechanisms are anonymous login, username/password, Kerberos and x509 certificates. The latter requires that the request message is accompanied by a signature to prove that the sender is in possession of the private key with which the certificate was created. There are two message exchanges required to establish a session: CreateSession and ActicateSession. The ActivateSession service can be used to switch an existing session to a different SecureChannel. This is important, for example when the connection broke down and the existing session is reused with a new SecureChannel. This entails that the client and server exchange so-called public keys. The public keys might come with a certificate from a key-signing authority or be verified against an external key repository. But we will not discuss certificate management in detail in this section. For the following introduction to the structure of OPC UA protocol messages, consider the example OPC UA binary conversation, recorded and displayed with the Wireshark tool, shown in Fig. 1. 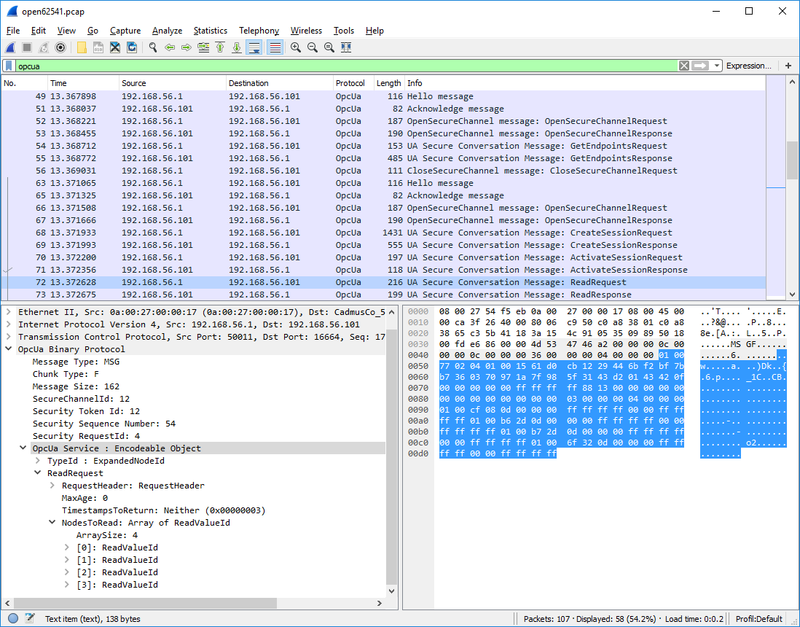 The top part of the Wireshark window shows the messages from the conversation in order. The green line contains the applied filter. Here, we want to see the OPC UA protocol messages only. The first messages (from TCP packets 49 to 56) show the client opening an unencrypted SecureChannel and retrieving the server’s endpoints. Then, starting with packet 63, a new connection and SecureChannel are created in conformance with one of the endpoints. On top of this SecureChannel, the client can then create and activate a session. The following ReadRequest message is selected and covered in more detail in the bottom windows. The bottom left window shows the structure of the selected ReadRequest message. The purpose of the message is invoking the Read service. The message is structured into a header and a message body. Note that we do not consider encryption or signing of messages here. As stated before, OPC UA defines an asynchronous protocol. So responses may be out of order. The message header contains some basic information, such as the length of the message, as well as necessary information to relate messages to a SecureChannel and each request to the corresponding response. “Chunking” refers to the splitting and reassembling of messages that are longer than the maximum network packet size. Every OPC UA service has a signature in the form of a request and response data structure. These are defined according to the OPC UA protocol type system. See especially the auto-generated type definitions for the data types corresponding to service requests and responses. The message body begins with the identifier of the following data type. Then, the main payload of the message follows. The bottom right window shows the binary payload of the selected ReadRequest message. The message header is highlighted in light-grey. The message body in blue highlighting shows the encoded ReadRequest data structure.